Lionel Messi celebrates a goal. 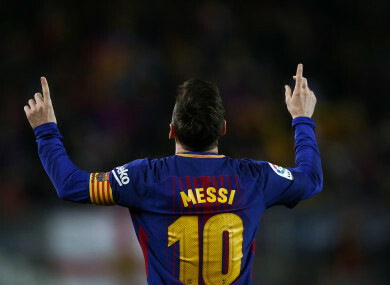 BARCELONA EQUALLED THE record longest unbeaten run in La Liga history as a Lionel Messi hat-trick inspired the runaway leaders to a 3-1 win over Leganes on Saturday to make it 38 league games unbeaten. Messi was the star of the show at the Camp Nou with a magnificent treble, as Barca stretched their lead at the top to 12 points ahead of second-placed Atletico Madrid’s derby against Real Madrid on Sunday. “This unbeaten record has not only been achieved this season, but also last year under (former coach) Luis Enrique,” said Barca coach Valverde. Valverde named a strong side despite having a Champions League quarter-final, second leg on Tuesday at Roma, with Messi, Luis Suarez and Philippe Coutinho all starting. But the hosts moved in front in the 27th minute through a trademark Messi free-kick. The Argentinian stepped up and curled the ball over the ball and into the bottom corner from 25 yards out to score his 27th league goal of the season. It didn’t take the 30-year-old long to double his tally for the day, latching onto Coutinho’s through ball and firing low into the corner. “To score goals is always good. We think that Messi has to stay active and he avoids any muscular problems,” added Valverde. Earlier on Saturday, Sevilla’s hopes of qualifying for Europe next season took a hit with a 4-0 thumping at Celta Vigo. Vincenzo Montella’s side were taken apart by former striker Iago Aspas’ hat-trick, as the ex-Liverpool man strengthened his claim for a place in Spain’s World Cup squad. Sevilla face Bayern Munich on Wednesday’s at the Allianz Arena needing to overturn a 2-1 deficit to reach the Champions League semi-finals. Email “Messi hat-trick helps Barcelona equal record unbeaten streak”. Feedback on “Messi hat-trick helps Barcelona equal record unbeaten streak”.